On this auspicious day of the Buddha’s Decent from the Realm of Tushita, which is one of the four major Buddhist holidays, the Gyalwang Karmapa traveled in the morning to Dzongsar Khyentse Chökyi Lodrö Institute to give diplomas to four new khenpos (professors and future abbots). Usually the head of the lineage performs this ceremony; however, to signify the close relationship between the Karmapa and Khyentse lineages, Dzongsar Khyentse Rinpoche kindly invited the Karmapa to take this role. For this special occasion, the wide path from the main gate of the Institute to the shrine hall was decorated with the traditional eight auspicious symbols, made of crushed stones in brilliant colors and lined on either side by a double row of marigolds. Walking down this path under a golden umbrella, the Karmapa entered the spacious shrine hall, which was filled with monks and lay practitioners from all parts of the globe. Students from the nearby Suja and Sambhota TCV Schools were also present. Once the Karmapa was seated on an elegant throne before a tall, radiant Buddha, Dzongsar Khyentse Rinpoche gave the traditional mandala offering along with the representations of body, speech and mind, followed by a long golden scarf. Rice and tea were served to everyone while the monks chanted the practice of the Sixteen Arhats, who are entrusted with preserving the teachings. His Holiness continued to explain that the Karmapas also have a close relationship with the Sakya lineage in general. The 6th Karmapa, Thongwa Donden (1416-1453), received teachings on the sutras from the great Sakya master Kunkhyen Rangton Chenpo, who in turn said about the Karmapa, “I have a student who is an emanation of the Buddha.” Karma Trinleypa Chenpo, who held both Sakya and Kagyu lineages, was a student of the 7th Karmapa and a teacher of the 8th. So it is clear that the commentarial lineage in the Karma Kamtsang has roots in the Sakya tradition. In general, the Karmapa remarked, these days we have available to us most of the outer and inner positive conditions, and the negative ones are few and far between. If we are able to muster our abilities and take advantage of these, then everything needed is present. To engage in studies and bring them to their fullest measure is extremely important he said. The Karmapa remarked that in continuing the rime tradition of the Khyentse incarnations, the Dzongsar Institute does not follow one particular lineage but welcomes students from all different traditions and so it has a wide-ranging influence. 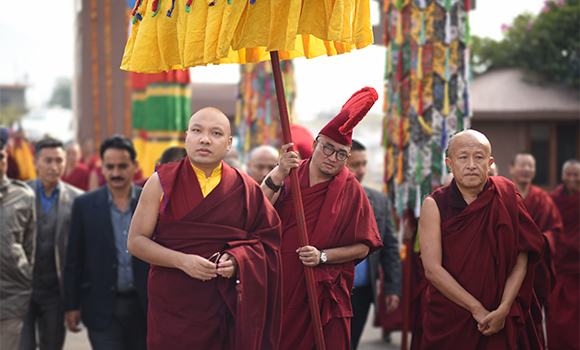 The Karmapa concluded with saying how fortunate he felt to have come and thanked everyone, especially Khyapje Dzongsar Khyentse Rinpoche, for whom he made the aspiration prayer that his activities flourish and spread widely. For his students in the monastic college, the Karmapa prayed that their minds be in harmony and their discipline be pure, and that they spend all their time in the Dharma activity of study and practice. After awarding diplomas to the four new khenpos, the Karmapa had lunch at the Institute and then left with Dzongsar Khyentse Rinpoche for the Bir Tibetan Colony. Khyentse Wangpo received numerous reading transmissions and empowerments from the 14th Karmapa and also met in his dreams the 3rd Karmapa Rangjung Dorje and the siddha Orgyenpa. Traveling to the Karmapa’s seat at Tsurphu, Khyentse Wangpo received many profound teachings from him and made the Karmapa one of the main caretakers of his terma. When the 15th Karmapa was born, Khyentse Wangpo was fifty-two years old. When the Karmapa was fourteen years old, Khyentse Wangpo invited him to his monastery and offered the young Karmapa empowerments. Jamgon Kongtrul advised the Karmapa to receive the Collection of All the Tantras from Jamyang Khyentse, and so at the age of 16, the Karmapa went to Dzongsar Monastery and, welcomed with great honor by Sakya Trizin as well, the Karmapa received all these empowerments and reading transmissions. At this time, Khyentse Wangpo said to the Karmapa that since he was a knower of the three times, he should write a history of his previous incarnations, which the Karmapa did in one night during the time it took a butter lamp to burn. Later, the 16th Karmapa would create a Tibetan opera based on this history. Khyentse Wangpo passed away in 1892, and of his five future emanations, the activity emanation was Jamyang Khyentse Chökyi Lodrö, born in 1893. His lifetime coincided with the later years of the 15th Karmapa and the early years of the 16th Karmapa. In terms of ordinary appearances, it is said that the 15th Karmapa did not meet Jamyang Khyentse Chökyi Lodrö; however, he made a connection with the Karmapa through a pure vision. Khakhyap Dorje passed away in 1922, and the 16th Karmapa, Rangjung Rigpe Dorje, was born in 1924. Jamyang Khyentse Chökyi Lodrö and the 16th Karmapa met numerous times both inside and outside Tibet and exchanged empowerments. It is said that their minds were blended together as one. The second Khyentse passed away in 1959 and was reborn in Bhutan in 1961 as Jamyang Thubten Chökyi Gyatso. The 16th Karmapa welcomed him to Rumtek, his seat in exile, and gave him a long-life empowerment and blessings. In Nepal, the 3rd Khyentse also received all the Kagyu Ngakdzo empowerments from the 16th Karmapa. When Rigpe Dorje passed away, Jamyang Thubten Chökyi Gyatso followed his Kudung to Rumtek.